No business builds a website just to build a website. It’s expensive so it better provide a lot of value. That’s why I say an effective website requires only 10% web design but 90% marketing. That’s because web design in itself might be useless. An amazing looking or functioning website isn’t enough. Those are the two big things web design focuses on too. Form and function are only important as long as it helps a business meet its goals. That’s why I’m a big proponent of balancing the art and science of web design. The form (or art) of a website is about 10% of the purpose and the function (or science) of it is the other 90%. Of course, these numbers are absolutely not scientific but I put in terms of 10/90 to stress the importance of everything that goes into designing an effective website. Often times cheap web designers will charge you for web design only. They’ll whip up a nice looking website for you and charge you $500 to $1,500 but that doesn’t do you any good. It just costs you money. That’s where the website as a commodity idea comes in. It’s how most people think of a website. That’s unfortunate because a website can be so much more than a commodity. Your business website is an investment that is anything but a commodity. All the raw ingredients need to be put together in a way that’s meaningful to your business goal. That means your website shouldn’t just be there, it should be making you money. Finding a good web designer involves one that is also well versed in marketing too. They don’t have to be a pro marketer but they must have a great working knowledge of it and how their job plays into that. So now a deeper look into the real mix of a website between web design and marketing. I’m a web designer by trade since the very early days. That makes it hard to admit that web design only matters in as much as the marketing part makes it meet the business goal. Yes, the design is still important for an effective website but it doesn’t make up the bulk of the cost of a website anymore. Putting together a good quality custom website without any of the important parts is quicker than ever today. It’s also very useless without a great plan behind the content and plan to meet the business goal. What are visitors going to do and how is a website going to get them to do it? That’s what you want to ask before you get a website. This is supposed to be more about what the 10% is, not what it isn’t though. A good web designer needs some pretty good marketing chops too. Web design involves making a website easy to navigate and use. If a website isn’t physically functional to visitors then it isn’t any good. Buttons need to be clickable, tapable, and easy to see. Speed is also a big issue that web designers need to focus on. Without a fast website then people aren’t likely to stick around to even complete the goal. There is a balance between speed and goals. The design of a website also needs to be easily scannable so people don’t have to read every bit of it. Web designers should be more closely aware of how the overall look of the text and pictures look. The web design 10% is always seeing the big picture of the website rather than the granular level. It’s making sure the overall flow and look of pages work well. That’s important but the details are where you get caught up in and have to spend a lot of time on. That’s where the 90% comes in. The design only matters as long as it plays a role in completing the business goal. This doesn’t discount web design completely though. A poorly designed website means the marketing side won’t work well at all. A poorly designed overall website means the details will fail to also. So how does the 90% factor into this all? This is where all the details come together and the overall design is made to work for the business. The marketing part means good copy, imagery that sells, and an overall message that has one goal in mind, to bring visitors to your call to action. That’s 90% of a good website and where the extent of time and involvement comes in. When you pay $6,000 to $15,000 for a website this is what you’re spending it on. This is where it all starts when creating a new business website too. You’re spending money on a website that actually meets your business goals and brings in money to your business. 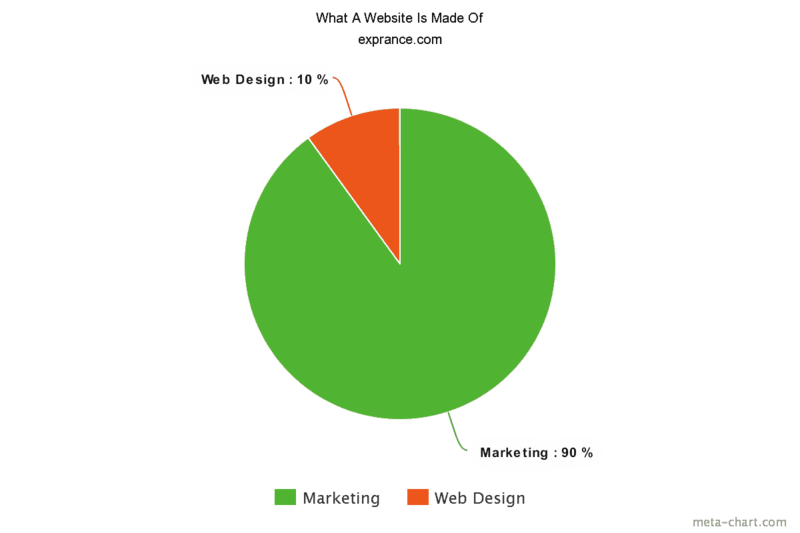 Most web design companies only deliver the 10% when in reality the 90% is what really matters to make money. How do you look at your website? I get a lot of leads that come to me who are shocked at my prices. They already have a website and weren’t expecting to pay so much for another one. That’s the question that matters and often why no matter how much it costs the client I have to tell them no, your current website isn’t enough. I can’t meet a business goal with something that wasn’t designed to meet the business goal. It’s hard to tell someone that a website that cost them $2,000 just two years ago is going to need to be redone. Not many take it well. A marketers job isn’t to deliver what someone wants to hear though. It’s all about delivering what’s needed to get the job done. When you buy a website and only pay for the 10% then you’re going to have to pay again if you want it right. The 10% cannot be separated from the 90%. They work together. That being said, the 90% is the part that people forget about when they want to get a new website. It’s the part that makes the 10% work financially and make money. The 90% is at the center of an effective website that meets the business goal. It’s impossible to separate the 90 from the 10 but they are both very important in an effective website. You don’t want a web designer who doesn’t work with a digital marketing expert or is at least very knowledgeable about marketing. You also don’t want a marketer who doesn’t work with a web designer or know web design very well. The content and how well it’s put together really makes the website come together. That’s why it’s important to have both the 90 and the 10. I wrote a guide that will help you know what every website needs. That’s only part of the story because it takes an expert digital marketer to make it all work. Business goals and meeting those goals often comes down to good marketing. That means marketing is the dominant part of a website and matters much more than the design itself. It all ties together though to make a 100% complete package. Most web design companies only deliver on that 10% web design part which doesn’t do anyone any good. If that happens then I or someone like me will probably be having that conversation about the website needing to be redone. Exprance is a Sacramento web design agency that doesn’t just focus on the 10%. We focus on the whole goal of web design projects.